I create a lot of test websites. Sometimes it’s for testing new things, other times it’s for testing upgrades. I’ve always found it’s a hassle to set a new website up, so I’ve tried to automate it. Log in to their system (usually cPanel) and click something like “New domain” or “New subdomain”. They further increase cost as they require much more powerful servers to run. Currently I can run my VPS for about $5 per month. If I used cPanel or Plesk, they would cost about $50 per month. So, if I can do without, it’s a big saving. You need to set up the web server to make the address reachable. I’ll assume the DNS is set elsewhere, or using a hosts file. I use Nginx as my web server. That’s quite a few things to set up, and it would be easy to miss something or get a step wrong. Even if you get it right, it will take a few minutes. The longest part is usually setting up the web server – especially with Nginx that configuration is set centrally and isn’t easily overridden outside of that. One day I got bored of doing it all manually, so I wrote a Bash script to take care of it. It’s not perfect, but it does a decent job. I decided I’d make it available via GitHub. If necessary, prints to the screen the password of the new Linux user. It’s not perfect, but it does mean I can set up a working website in five seconds, rather than five minutes. There are, of course, some things that may need to be changed once it’s done, like modifications to the site’s Nginx configuration, but without changing anything, it will happily serve static and PHP content. NGINXCONFIG – this is where the Nginx configuration is stored (in Ubuntu, that’s /etc/nginx/, but it may be different on other systems). It makes my life a lot easier. Maybe it will help a few other people too. Ever wondered how people learn how to solve things? Well, sometimes you just have to break it first. Pro tip: just make sure you don’t break it on something important. Lucky for you – and me – I remembered that bit. I know, I know, this isn’t really what you’re meant to do. The idea of a guide is to do something useful, to solve a problem, to help people do something quicker, or better… but sometimes, it doesn’t work like that. Sometimes, things happen that give you problems. Well, I managed that today, so I thought I’d share it. It was – strictly speaking – a work thing, but on a test server that had nothing on it, and already had a slight problem, and I had a feeling it might not go to plan, but I thought I’d try it anyway. We have a Ubuntu virtual machine which is used for occasional testing for two websites we look after internally, and it turned out the virtual machine’s network connection stopped working because of an issue on the host. Thus, the server was suddenly not a whole lot of use. 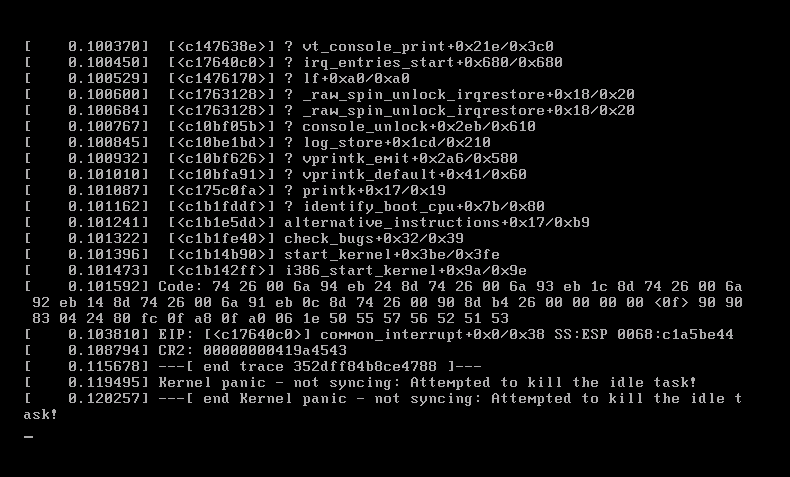 It turns out, it caused a kernel panic and wouldn’t finish booting. It would definitely be quicker to reinstall, but that’s essentially what would happen if it was a real box, the NIC failed and you had to install a new one. I’m currently debating how curious I am, and if it’s worth seeing how easy it is to resolve an issue like that. I guess it would be nice to know I’d be able to fix it, but I’m currently tempted to take the lazy route.